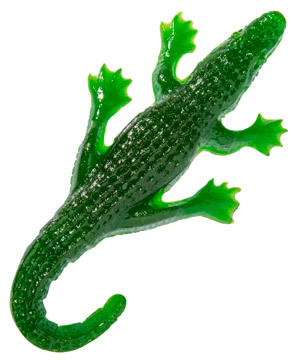 Giant Gummy Gator: Alligator made of pure gummy candy. This highly-detailed candy treat has the scales, teeth, and claws just like its bigger, less edible sibling. 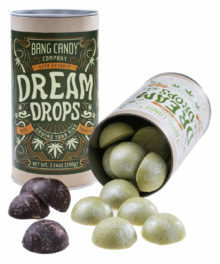 Stalk your favorite flavor, green apple or cherry, and pounce when the time is right. Now the hunter has become the hunted. 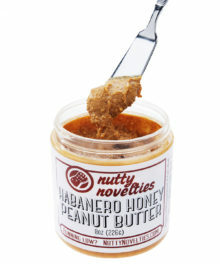 Looks good, but where to start? How do you eat an elephant? One bite at a time. 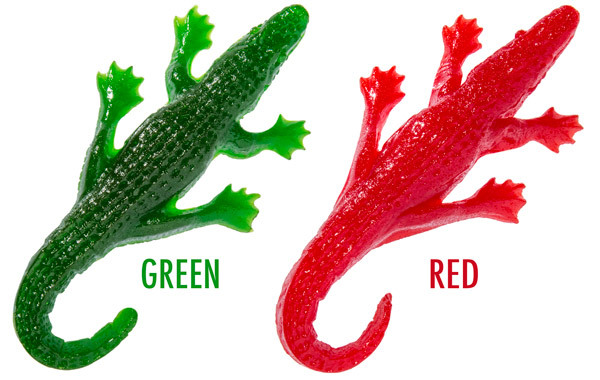 How do you eat a Giant Gummy Gator? The same way. But which body part do you start with? Are you an appendage-first person? Do you consider a tail to be the ideal appetizer? Or do you feel more humane starting with the head? 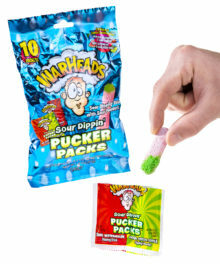 Anywhere you choose, you’re sure to encounter delicious, chewy gummy! They say the belly is the most vulnerable spot. 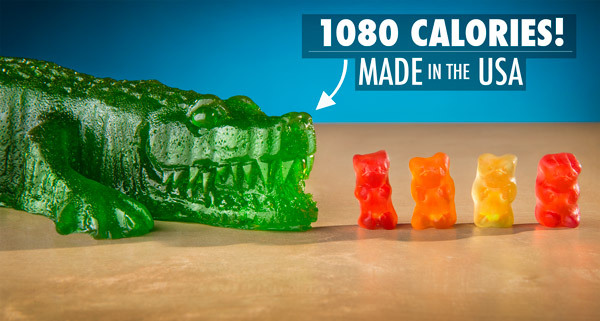 Each Giant Gummy Gator packs over 1,000 Calories! The average recommended daily allowance is about 2,000 Calories. So if you’re going to wrestle this gator, it’s up to you to decide which meals you’ll skip to stay within the RDA. It’s bigger than a live gator hatchling! Gators are known for their terrifying bite. 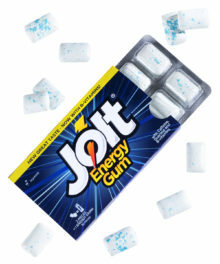 This is your chance to bite back into their delicious gummy flesh. Choose between Green Apple and Red Cherry—there’s no wrong choice. 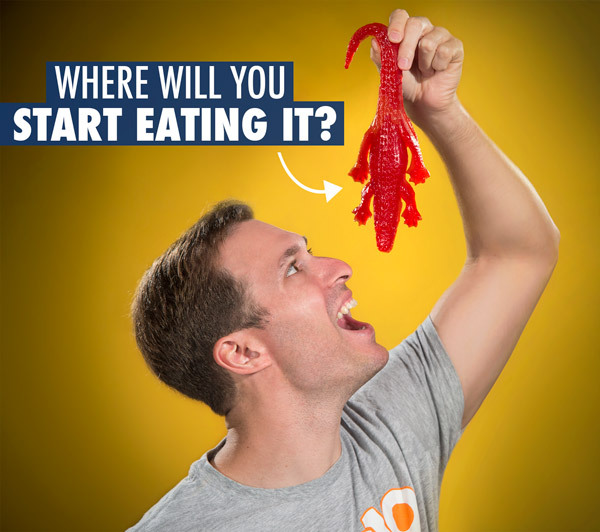 Members of Vat19's video crew take a first look at (and bite into) the Giant Gummy Gator in episode #7 of Peep This. Question: I’m allergic to certain things. What are the ingredients? 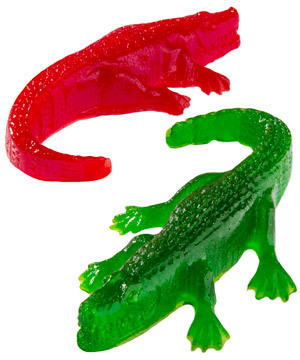 Answer: The Giant Gummy Gator, like all of our giant gummy products, contains: corn syrup, sugar, gelatin, citric acid, sorbitol, natural & artificial flavors, vegetable oil, carnauba wax, canola oil, lecithin from soybeans (contains soy), water, rosemary extract. Question: What dyes are present? Question: Is it halal, vegan, or vegetarian? 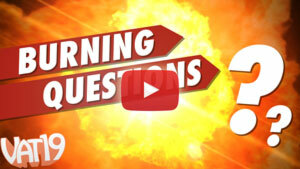 Answer: No, the gelatin used is not certified halal, vegan, or vegetarian.